A lot of people struggle with figuring out how to keep weight off after dieting. You see, most people don't have a hard time losing weight initially. Early in a diet phase, the body hasn't adapted to the new low-calorie intake. It's not until a few weeks pass or after they lose weight that things such as cravings, lower energy, slower metabolism, and general lethargicness begin to creep in. The first email is asking for advice for actually losing weight. I typically answer as many questions as I can and point them towards relevant posts on my site. I don't hear back for a few weeks or months and assume everything is going great... and then I get the second email. "Carter! I lost some weight but gained it all back again!? Like...WHAT THE HECK!?!?!" Tons of people have successfully lost weight using a number of different weight loss approaches. Losing weight in the short term is actually pretty simple. If you have discipline and commitment sticking to a low-calorie eating plan, you can expect to drop pounds and inches from your waist. The real challenge comes with sustaining the new lean body you've acquired. Don't get me wrong; It took hard work and dedication to lose 140 pounds, but I am prouder of the fact that I have been able to sustain that weight loss over the past three years. 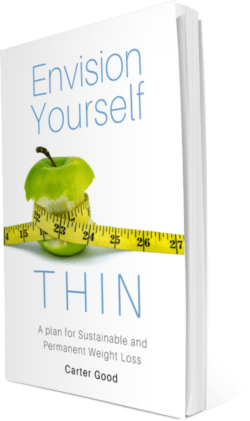 My Program Envision Yourself Thin goes into greater detail of how I've been able to do that, but this post (and series) will cover some of the best strategies I've developed for sustaining weight loss success. This is going to be a 3-part series explaining the best practices I have come across for not only losing weight but sustaining a healthy body forever! So without further ado, here is Part One. The first part of this series is going to talk about the importance of establishing healthy habits. As you know, there are both good and bad habits. Your goal should be to have as many good habits as possible and in doing so reverse or eliminate the bad ones that are causing you to struggle with weight. Firstly, How do Habits Work? One of my favorite books of all time, The Power of Habit, has taught me quite a bit about habits and how they work in our day to day lives. 1. Our eating habits, spending habits, and social habits are all dictated by our cravings and desires. We crave love, so we go on dates. We crave comfort, so we constantly distract ourselves with goods and entertainment. 2. All habits, good and bad, follow the same pattern than author Charles Duhigg coined "The Habit Loop." Keystone habits are special habits that cause a domino effect in your life. By changing one keystone habit, you automatically create a bunch of new habits. For example, say somebody decides to start eating a healthier diet. If they manage to keep it up, they'll likely have more energy during the day. This will lead to them to be more productive at work, more social and outgoing. This could result in them getting a promotion or even find a better job. Your mindset towards health, food, and your body is what will ultimately dictate your success or failure in losing weight. Healthy Habits play a big part of this "mindset", so it's important you learn how to create them. Creating a new habit is actually quite simple. All you have to do is use the Habit Loop chart I provided above as a blueprint. Good practice for this is to use a reminder (or "cue") as something that you already do. If you want to start flossing more, use the "cue" of brushing your teeth as a reminder to floss. If you try to make a life-altering habit right off the bad, you'll probably fail to stick with it. Make small healthy changes and over time, these will add up to make a big difference for your health and well-being. 3. Remember to reward yourself! 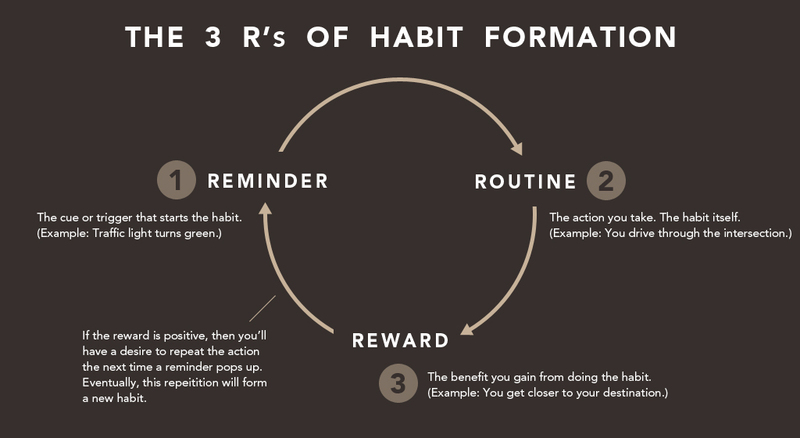 Don't forget about the reward...without it, the habit loop wouldn't be complete! You are creating small habits, so it follows suit to use small rewards. Something I like to do is set a reward that I get after following a habit for an extended period. Ideally, this reward will go along with your new healthy habit. For example, If you made the habit of drinking less soda and more water during the day, set the goal (reward) that you'll buy yourself a fancy water bottle after thirty days of consistently following your healthy habit. It may not seem like much, but creating these small, healthy habits can really add up. One small habit might not make much of a difference, but 5,10,20+ and you'll start to see some seriously epic changes to your health and well-being! This program Reveals Everything You Need to Know About Habits as Well as Other Crucial Tactics That Will Lead to Successful Weight Loss and Teach You How to Finally Keep the Weight Off Forever!